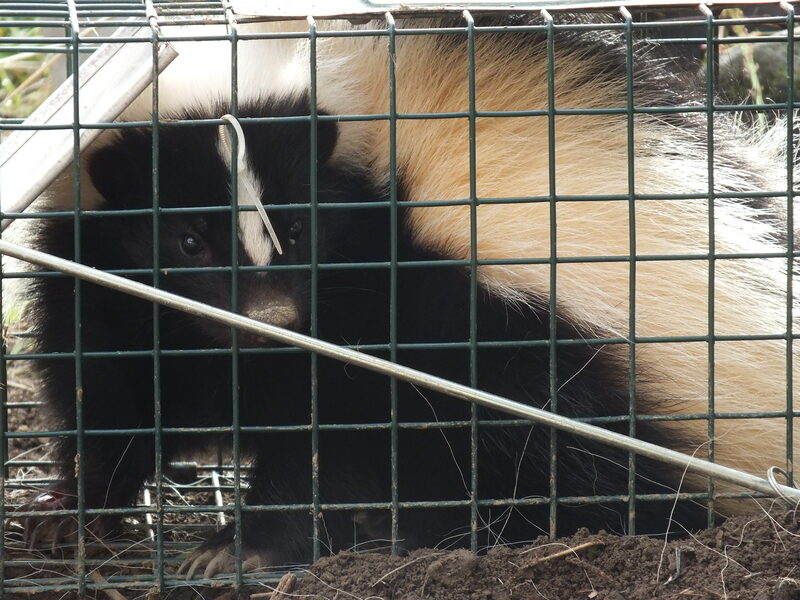 Limited time offer….FREE SKUNK! *** | Ah The Things I've Done! The third skunk I have caught in my yard in 2 nights. You heard me correctly! For a very limited time you can have your very own skunk! Imagine the fun you will have as you clear crowded lines by simply taking the cover off his cage! Or how about your brother in law who always comes over to your place to watch football? He loudly passes gas on your couch, and always leaves you toilet clogging surprises before he goes home… but when you’re at his place? You have take your shoes off before he allows you to set foot in his man cave, and you always have to use a coaster? HA! You take this little stinker with you and set it loose under his sofa when he steps out for some more ice! Have that camera ready when he sits back down, and you are on your way to having the next viral video!! Just be sure you have your shoes on, and you are ready to make your retreat! Also, don’t expect the usual six pack of Schlitz and a tub of tri flavored popcorn come Christmas time! Fired from your job? Get your revenge by shutting this little guy in the executive washroom! Lighting a match, or the old double flush method wont do the trick for this gassy odor! Better yet! Set it free in the air conditioning ducts! Did your ex girlfriend stink up your place with incense and candles? Well go over to her place one last time while she is at work to retrieve your favorite sweater, and your Taylor Swift CD’s. Then leave her this furry little token of your undying affection! One thing is certain…your memory will linger on in her mind, long after you have your place smelling like dirty socks moldy towels again! Yes, the applications for having your own little skunk are nearly limitless! So what are you waiting for??? Drop what you are doing! Get over here fast! Come on down and pick him up before your chance is gone! Just be sure to bring your own carrier… But don’t delay! An offer like this is bound to attract millions, and I only have one skunk to offer. This is a strictly first come first served opportunity, that may only be repeated a dozen times in the next few weeks!! ***Please be aware that skunks are wild animals, and as such may bite, scratch or infect you with dangerous diseases in addition to likely spraying you as soon as you try to pet them. Also, state and local laws forbid ownership of wild animals without special permits. The use of skunks for revenge may also end in legal charges being filed against you in civil, and/or criminal courts. This post is intended for entertainment purposes only, and I will not let you have my skunk. Rest assured, he will be released back into the wild, far away from my chickens at a location previously suggested by a local game warden.